The future always has a past. James O'Neal, who started his career as a crime writer under the name James O. Born, took to science fiction after moderating a panel with Jeff and Ann Vandermeer. His first science fiction novel, 'The Human Disguise,' was set in a dystopian, disturbing future-Florida where cop Tom Wilner pursued his ex-wife and a crime lord against a backdrop of everything going to hell, with immortals and aliens lurking in the shadows. 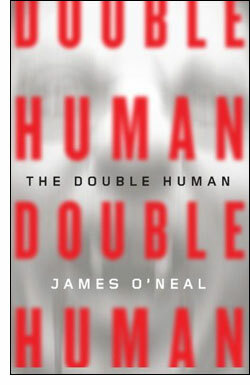 Now, Wilner is back, in 'The Double Human' (Tor / Tom Doherty ; June 2, 1010 ; $24.99), this time looking for a serial killer with a serious past. O'Neal's science fiction runs on three very different levels. Word-by-word, readers get a police procedural, by an ex-cop, no less, who knows his stuff and his streets, and likes that latter mean. Wilmot's unfolding cases are written from the ground up, which not surprisingly, grounds both the reader in a viscerally realized world. That world is the second level of O'Neal's SF, a well-imagined day-after-tomorrow Florida where the world is quite a bit farther in its insistent march towards hell. High-tech stuff like DNA is too expensive, the databases too screwed-up to use. Mass migrations, crime gangs of every stripe, lots of domestic terrorism, bio-terrorism and stuff being blowed-up just for the fun of it. In the midst of this big ol' mess, Wilner finds himself on the trail of a serial killer, and as starts to suspect that the killer may have been operating 25, perhaps 50 years ago. And that leads us to the third level of O'Neal's SF, the lurking immortals, the impending alien invasion, all the stuff of fifties pulp recast for a post-21st century audience. Seeded in the background, reaching into the foreground to provide plot leaps and surreal terror, the things that share the planet with us that are not human, the final links in the food chain, are growing bolder. O'Neal knows how to spin a snappy story that both undermines and underlines our understanding of reality. Of course, with all this stuff going on, something has to give. So far, we get pretty self-contained crime stories against the larger backdrop of the immortals and the aliens, whose stories get notched along, but not wrapped up, not, at least, in this novel. O'Neal and or Tor are canny enough not to declare this either a series (which it certainly is) or [worse] a trilogy, which I hope it is not. There's enough completion in 'The Double Human' to satisfy the reader and enough left unanswered to ensure a return of mostly the same folks in mostly the same milieu. O'Neal's first foray into SF, 'The Human Disguise,' which I wished had been published as a hardcover apparently did well enough to ensure this second Tor book is a hardcover. And so we launch ourselves into the future with James O'Neal, with considerably more optimism than the characters in O'Neal's world. We're all figuring that things will remain stable enough to ensure that the sequels will arrive before the world they portray does. I was encouraged to read a child — but not comic books. They were verboten, and if I ever bought one for myself, I don't remember. This does not mean that I never saw them, however. I'd already read the novel, but the comic book was a different story. You could see the monsters. Leave it to Jeff Connor, once of Scream/Press, to invert the whole Classics Illustrated concept. 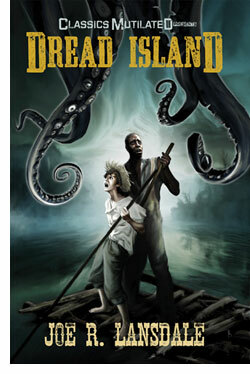 The new "Classics Mutilated" line was auspiciously launched at Comicon this year with 'Dread Island' (IDW Publishing ; October 2010 ; $16.99-$100), Joe R. Lansdale's remix of Mark Twain and H. P. Lovecraft. That price spread starts with a trade paperback edition and winds up with a 100-copy signed and numbered leatherbound edition via the IDW website. Though IDW is a comic publisher, the Classics Mutilated line seems like it's going to be prose-only; at least from the evidence at hand. That evidence is Joe R. Lansdale in top form and printed in gloriously large type with a tale that beings together Huck Finn, H. P. Lovecraft and Brer Rabbit. Lansdale was writing these kinds of stories long before they appeared on bestseller lists, and his touch here is gritty and weirdly surreal. This is absolutely vintage material, beautifully presented. 'Dread Island' is narrated no less than Huck Finn, who along with Jim, is sent by Becky Thatcher to the mysterious island that rises in the Mississippi. There, he'll meet the Brer People, and a nasty critter that goes by the name of Cut Through You. It's not a good place, even if the Brer People are themselves ... well, they're not like Cut Through You. Via Huck, Lansdale spins a gob-smackingly original tale that is at turns unreal, unpleasant and uncompromising. It's also laugh-out-loud funny. 'Dread Island' works, and works well, because Lansdale gets the voice down right. He gets the colloquialisms, the pace, the feel, just perfect. You really hear the drawl even though he only rarely phoneticizes the language. Instead, he relies on clever wordcraft to create the illusion of period writing while the prose itself is pure honey; goes down smooth and sweet. Of course, this is Lansdale, so expect a lot of rude humor in that rich prose. Leave it to Lansdale to give "turd" an authentic literary feel. But there's more than just a good tale spinner in 'Dread Island.' Lansdale has a great story to tell that is sweet, and funny and horrific by implication without going overboard. His remix of genres and stories is inspired. Lansdale has managed to find the commonality that lurks beneath the work of Mark Twain, Joel Chandler Harris and H. P. Lovecraft, the perception that reality is unpleasantly unsound. We like our world to be pretty solid and predictable, but it's not. Around the edges of society, sobriety and civilization, things break down, come unglued. You wander too far beyond the beaten path, and life's going to walk right up and teach you a lesson. Your best hope is that it's a talking rabbit. Anything else is libel to cut through you. The inevitable is ever arbitrary. Those things which we cannot avoid, the obstacles between where we are and where we want to be, between who we are and who we want to be, seem to created with irrelevance in mind. Every day we must cross a border that is not of our choosing. For most of us, these crossings are internal. We make a decision or a choice, and in a heartbeat we cross from one state to another without thought. But not all borders are internal and not all choices are without consequence. That which transpires in an instant can impose a cost that it will take a lifetime to repay. David Corbett knows the importance of asking the right questions. For fifteen years, he worked as a Private Investigator for Palladino & Sutherland, and working on high-profile criminal and civil litigations, including the Lincoln Savings & Loan Case, The DeLorean Trial, and The People's Temple Trial. His newest novel, 'Do They Know I'm Running?' (Mortalis / Random House ; March 2, 2010 ; $15) begins with an eerie and tense confrontation. The lines are unclear and the threat is mortal. But the question is not who is a danger to who; rather, it is how did we come to this place? 'Do They Know I'm Running?' is the story of an everyman American Boy, Roque Montalvo; the sort of kid-next-door who plays a mean guitar and dreams of being a rock star. In Roque's case, the dreams are a line that he may prove to be quite capable of crossing. He has the gift. But he also has a family; his brother Godo is an Iraq-war vet who came back in pieces, badly put together. And his uncle Faustino has just been deported to El Salvador. Roque finds that he's the kid who has to put all the pieces of his family back together. He'll be crossing the line into adulthood, which means going to El Salvador to try and bring his uncle back. 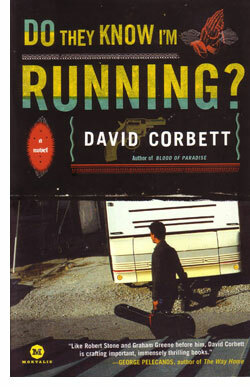 Corbett's novel has the raw, powerful feel of a documentary film. It's gritty, violent, but also engagingly emotional. His prose rides that line between sparse and evocative. Like any good detective, he knows when to tell us the details, and he knows when to hold them back. He involves us in the hearts of his characters, and we make that investment gladly, even if it looks to be harrowingly dangerous. The rewards outweigh the risks. But Corbett also knows how to write a ripping yarn. Roque, the family he was given and the family that he chooses, are all on the wrong side of both sides; they're prey to the criminal predatory gangs that now control illegal immigration, they're criminals to the police who control the border and they're a potential threat to anyone who sees them and perceives them as not one of us. Corbett does not shy away from the dark, casual cruelty that casts fear into the lives of those in the shadows of the gangs. He doesn't dwell on it, but he knows how to crank up the tension and create memorable scenes; not just for the orchestration of action, but as well, for the character arcs of these people his readers come to care so much about. With every word and every paragraph, he's forging a new sort of noir, set in the desert of the human heart. For all the compulsive readability of 'Do They Know I'm Running?' it's also a fascinatingly relevant meditation on the problem of human borders. While we like to think that our current problems are utterly original, that we invented them with our technology and economy, the fact of the matter is that humans have been moving around since before we were strictly human. We're hunters and gatherers. Corbett's novel taps into the universal problems of humans moving around, of territoriality and immigration. Random House is doing some great things for the mystery genre with the Mortalis imprint. Novels like Corbett's push the boundaries of genre fiction, or those of literary fiction, depending on the direction you approach them from. Corbett's work is indicative of how a close-to-the-ground approach can satisfy readers who are looking for a ripping yarn and those who are looking for a fresh perspective on social problems that press closer with every day. Sure, things have gotten ugly of late. We seem to be upping the ante for ugliness, in fact. The division between the haves and the have-nothings is armed to the teeth with guns and rhetoric fueled by selfishness and self-doubt. Is charity possible? Is it even, really, good? We can look into a mirror and see who we are. That silvered glass is a border as well, one that is not so easily shattered. Corbett's novel puts us on both sides of that mirror and asks us to take a good hard look at who we are — and who we want to be. How easy will it be to cross that line? How hard will it be to get back? We're surrounded by the things we make; architecture, art, food, culture, business, religion. Each creation is unique, a thing of the moment and marker of that moment in time. Perceived through time, the world we create seems to change, sometimes slowly and sometimes quite abruptly. We record the changes in a variety of media and call them history. But lost amidst the changes, amidst the things that are built up, torn down, mowed down, destroyed, re-constructed, built over, improved, modernized — are those things which do not change. The builders, the makers, the artists, the businessmen, the low-level servants, the bureaucrats, those who are appointed our rulers and those who appoint themselves our rules. History, that record of change, is made by the one thing that does not change. Us. 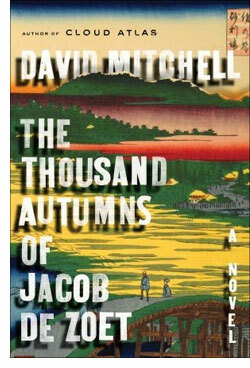 David Mitchell's latest novel, 'The Thousand Autumns of Jacob De Zoet,' (Random House ; June 29, 2010 ; $26), journeys some two hundred years into the past, only to find that humans, ever mutable, always changing their environment, themselves — never change, not really. Jacob De Zoet, the young Dutch tradesman dragooned to Dejima, a man-made island off Nagasaki, is a man like all of us, marooned. Sent from the Netherlands with the promise of marriage upon return, he finds himself immersed in another world, and another culture; it's not just the weirdly alien culture of Japan that is different. The artificial world of Dejima is itself an alien world, a tossed-together wreck of trading and traitors, of scoundrels and sailors where, as ever, as even in this very moment of history now, they're making it up as the go. Rules are primarily made, then re-made, the tweezed as they are broken. The only guiding principle resides in the heart of each man and woman. We always, in the end, answer to ourselves. Mitchell's latest novel is a powerful exercise in building worlds from words, and the words in this novel will simply sweep the reader away. Mitchell's prose is lively, funny, entertaining, and attention-grabbing. He never lets you go and never lets the pace lag. Immersing yourself in the language of this novel is an exercise in the joy of reading. Sentences you never want to forget crowd the pages, riffs you will always remember will fill your mind. Starting with building blocks of words that are chosen with a care beyond compare, Mitchell crafts a powerful novel of powerless people, people caught in the eternal things we build for ourselves. The businesses that corrupt and cajole, the religions that deny and destroy, Jacob De Zoet and a huge cast of characters come to life between the things they create and the things left to them by those who came before. Quiet heroes, intelligent scientists, doctors who truly care about the wellness of those they truly serve; these people blossom to life with Mitchell's prose. And though the culture and the setting are almost as alien as any planet dreamed up in the science fiction genre, the people, Mitchell's characters, seem so true-to-human that we, readers here in the 21st century feel that that they could easily step from then to now, that, with a bit of reading, they could easily live. We feel that they are alive, in our hearts, as we read. Built from prose, enacted by people, Mitchell's story, his plot, his novel is an engrossing, involving reading experience. There is a feeling of fate and a feeling of chaos, mixed in the way our lives mix them. We are in control of our lives and yet our fate is in the hands of those we're unlikely to ever meet. We feel this happen to Mitchell's characters even as it happens in our own lives. 'The Thousand Autumns of Jacob De Zoet' is a riveting vision of a new world, the old world — our world. It is a kaleidescope and a mirror of words.